If you’re planning to teach in the state of Oklahoma, you’ve likely already realized there’s a lot you’ll need to know in order to obtain your certification. From the multitudes of skills you’ll have to gain competency with to knowing how to approach and work with your students, there are many nuances and details to keep track of with this important field. Prepare with our OGET Study Guide and Practice Questions. Print or eBook. Guaranteed to raise your score. Get started today! Now that you’re nearing the end of your training, there’s one last hurdle you’ll have to clear before you can enter the professional world: earning a passing score on the Oklahoma General Education Test, also known as the OGET. The OGET is one of the OSAT’s general subject tests, designed to evaluate your knowledge of how to teach at a basic level. While this test may sound pretty rudimentary, it’s actually anything but. To score well on this exam, you’ll need to have good mastery of critical thinking. The Mometrix Test Preparation team understands just how important this exam is to your future career goals. To help you toward success, we’ve composed an OSAT Oklahoma General Education (074) practice test. We’ve designed this practice test through careful research to ensure you receive as accurate a study resource as possible. Each of our Oklahoma General Education practice questions deals with a subject you can expect to find on the real OGET exam. OGET Flashcards. Proven OGET test flashcards raise your score on the OGET test. Guaranteed. Like the full test, our 101 practice questions split into two subareas. One question falls under the “constructed-response” category, its only subject being Critical Thinking Skills: Writing (20 percent). The “constructed-response” category qualifies as essay response, while “selected-response” is multiple choice. We encourage you to incorporate this 100 percent free study tool into your study plan. For the most thorough study experience, you can combine this Oklahoma General Education practice test with our companion study guide. Good luck! 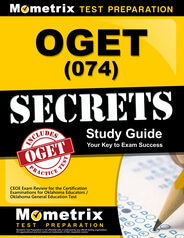 Explore our free OGET review provided by Mometrix. Check out our premium OGET study guide to take your studying to the next level. If you benefit from these materials, just click the link below! 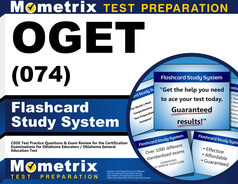 To compliment our OGET book, we also offer extensive OGET flashcards for even more OGET test prep help. We hope you enjoy our products! Your purchase helps us make more great, free content for test-takers just like yourself.